What do you do when your bride has a future husband, two fathers and five brothers who cant see her until she is dressed and she wants some one on One time with all them?? We solved the riddle by doing four first looks at this wedding. It was a lot of fun and we captured some wonderful images in the process. This last shot was her five brothers walking down the driveway to see her and bringing her the bouquet for formals with the rest of the family. The wedding took place at the Wallace falls lodge in Gold key Wa. The Lodge is set on 10 private, secluded acres, with year round views of the Cascade mountains from the lodge and grounds with hiking trails that lead to the 260' waterfalls. "Wallace Falls" and to the secluded Lake called "Wallace Lake". This is an awesome B&B that families can come and enjoy the beauty of the Cascade Foothills, the many hikes nearby, bring your mountain bikes and ride along the miles of country roads, fish in the Skykomish and Wallace rivers. Hit the ski slopes, and cross country trails in the winter. They are also set up for families to have weddings at the facility. It has an outside area with an arch, a tent for receptions and an attached building that can be used for food service or additional reception space. 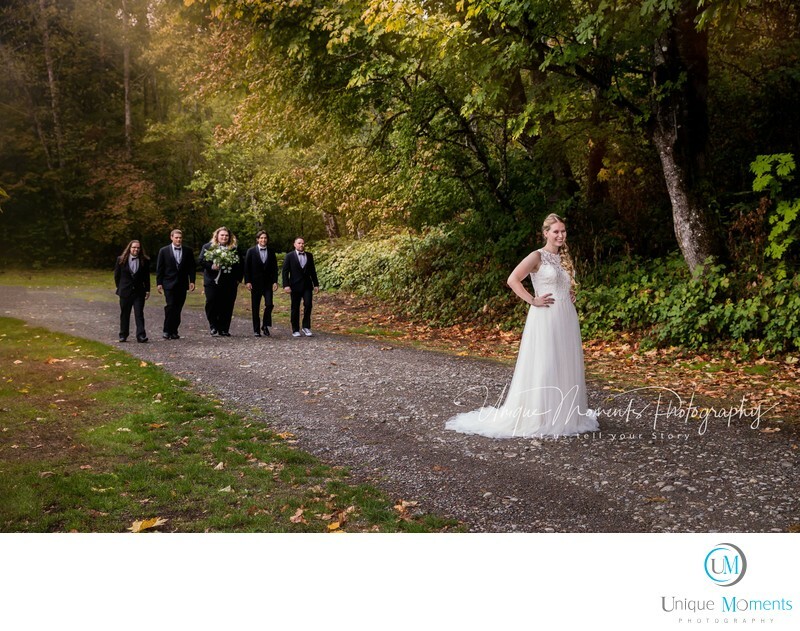 If you want to treat the whole family to a unique experience for your wedding, Wallace Falls Lodge is a place you should consider. Location: 14424 Wallace Lake Rd Gold Bar, WA 98251.